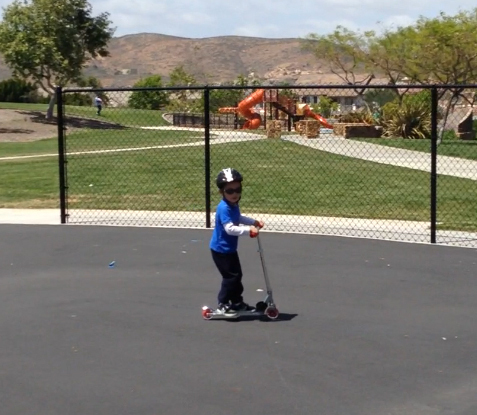 Last Sunday my son and I were at the park and he is still getting used to his new scooter. He was getting really good but is not used to using the brake so he puts his foot out to slow down. Well, he lost his balance going down a slight hill and fell. No big deal right? Kids fall all the time and minor scrapes and bruises are pretty much normal. This time was different. He hit his front teeth. There was blood coming out of his mouth, his nose, his lip and his gums. He hit his front tooth so badly that it was tilted back about 20 degrees. When my wife saw him, she was in tears. So as a dentist, I brought to the office right away for some xrays. I gave him a local anesthetic and pulled his tooth back into position. My son was a champ. No problem. He was very interested in everything I was doing and never complained. So now its been a few days and its time to test the tooth to see if the nerve inside the tooth recovered and is alive. Its an easy test with cold liquid on a piece of cotton. The test was a success and the tooth is normal. What a relief! No change in color of the tooth either. Sometimes injured teeth turn grey and brown. My wife wants to return the scooter back to the store but I told her that the only way to learn was to once in a while fall. I think I’ll buy a new helmet that also covers his mouth.